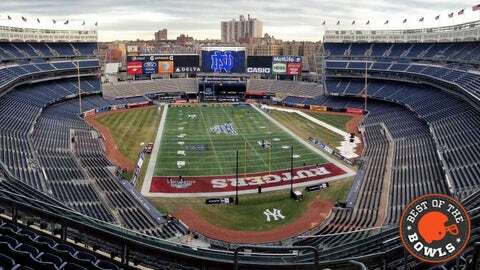 Well, at least the scene for the Pinstripe Bowl was a nice one. 1. REM sleep (noun): A recurrent period of sleep, typically totaling about two hours a night, during which most dreaming occurs as the eyes move under closed lids and the skeletal muscles are deeply relaxed. 2. Notre Dame beat Rutgers, 29-16, in the Pinstripe Bowl. 3. It’s a problem when the most interesting thing about a bowl game occurred before kickoff. Saturday morning, before engaging in a sleepy football game, Notre Dame announced George Atkinson III, a junior running back, and Jalen Brown, a junior corner, would miss the Pinstripe Bowl for violating team rules. The tweet was then deleted. If we can all agree that simply texting during a team meal can’t possibly be the only reason Atkinson was suspended for the bowl game, then this unsolved mystery immediately becomes the most pulsing question of the Irish’s trip to the Bronx. 5. Lifeless, you say? Notre Dame, a national brand with a long and proud New York City history, and a team from a state just across a river could embellish their record-setting attendance by 5,000 and still be 2,000 fans shy of a Texas high school game. Yes, lifeless, I say. 7. However, it would be nothing short of a national nightmare if this football game is the last Yankee Stadium moment of 2013. It’s nothing personal against Tommy Rees or Chas Dodd or the nine field goals that were kicked while your eyes were moving under closed lids and your skeletal muscles were deeply relaxed. It’s just that, well, something amazing happened here not too long ago, and I don’t care that we’re talking about college football right now. This, not the Pinstripe Bowl, deserves to be the final Bronx memory of the year.